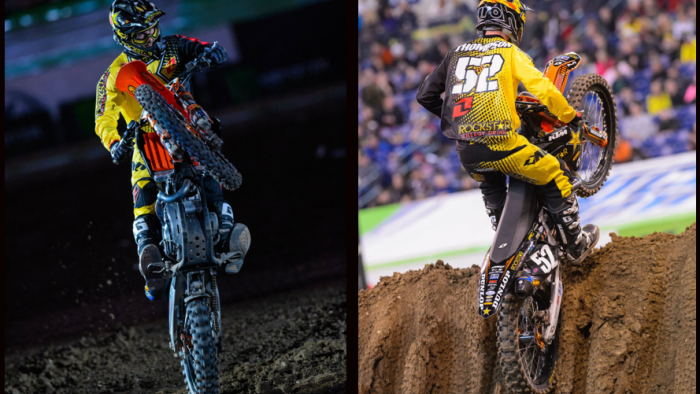 Indianapolis Supercross was a night and day difference from the track surface at the first two East Coast rounds. Every corner, jump face and landing was riddled with ruts the entire width of the tack. The two whoop sections were so destroyed and treacherous, it was a challenge for the riders to even keep their feet on the pegs without having them ripped off. It was certainly the polar opposite of the hard packed tracks in Arlington and Atlanta. Ivan Tedesco had his worst night of the year since joining the team at Anaheim 1. After having a tough go in practice, which was not an uncommon occurrence for nearly every rider on the day, he missed qualifying for the main in both his heat and semi. Then immediately after the gate drop in the LCQ, the evening was over for Tedesco. He came together with another rider and was quickly sucked up into his rear wheel. While that sounds like a terrible place to be, it was much better than being hooked up with his cartwheeling bike. His KTM 350 tumbled end over end in spectacular fashion. Ivan was very lucky to not get badly hurt. Ivan Tedesco: "Crazy night for me. Track was super gnarly and I struggled all day. I ended up in the LCQ and on the start got sucked up in another bike. That ended my night. I feel lucky to have walked away unscathed." The excessive difficulty of the track may have gotten to Cole Thompson a bit. He was a bit tentative all day in practice and seemed to be missing the aggression needed to deal with a track of that nature. He was however able to pull it together for his qualifier and move directly into the main. Then in the main he was able to make it through 15 laps without going down, which was an accomplishment in itself. As the checkers waived he extended his streak of top ten finishes to 3 for 3. Cole Thompson: "Finished 9th place tonight. Tricky track with lots of lines, made for tough racing. I stayed on two wheels but couldn't make the passes happen quick enough. On to Daytona now, looking forward to another week of hard work and putting in a strong finish next weekend." The team heads to Daytona, FL next week to face another completely different animal of a track. Suspension settings will be vital when moving to what is more like an outdoor than any other Supercross and will certainly be very rough. Tedesco will thank his lucky stars that he is uninjured and Thompson will continue to work towards a top 5 finish.